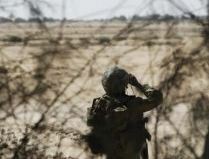 The Palestine News Network reports that a worker in Gaza has been wounded by fire from the Israeli army.A group of workers were allegedly gathering materials near the border when Israeli soldiers opened fire on them. One was injured during the shooting. Israel controls all materials that are allowed to enter or leave Gaza. Since 2006, it has imposed a blockade on the coastal enclave, which has led to a humanitarian crisis described as ‘dire’ by the UN. Construction materials are in very short supply, particularly since Israel destroyed large numbers of buildings during operation Cast Lead in 2008-9. As a result of this, many Palestinians collect rubble and other material that can be used in construction. Often this draws them close to the 300meter ‘security zone’ that Israel has imposed around its border with Gaza. Israeli soldiers shoot Palestinians who enter the ‘security zone’. Many Palestinians claim that they are shot at from over 500 meters away.